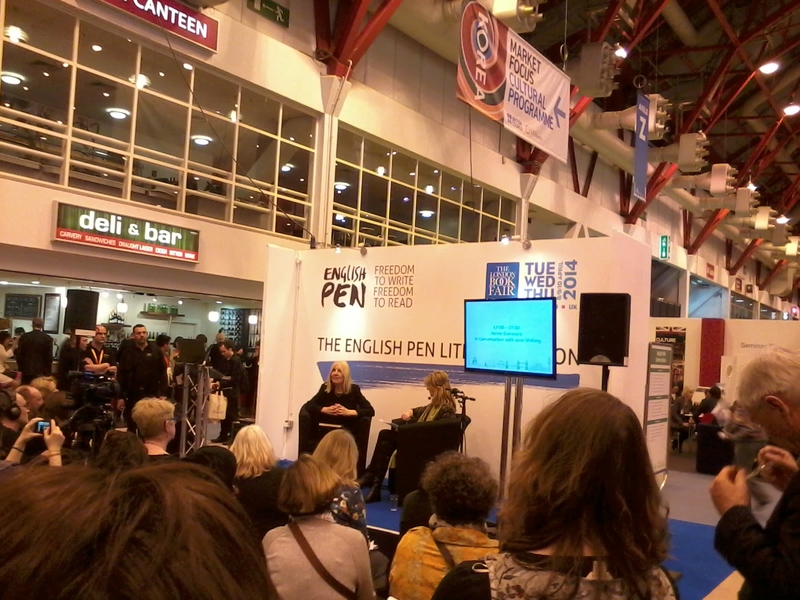 This week is the London Book Fair, and on Tuesday I went down to London for the first day of the Fair. I was a little low on funds after having already spent a fortnight there on placement recently, so I decided to just go for the one day, which turned out to be a l-o-n-g daytrip when you’re travelling from Cumbria to London and back in a day! I had to get the first train of the day just before 7am and and got to the Fair around 10.45am. 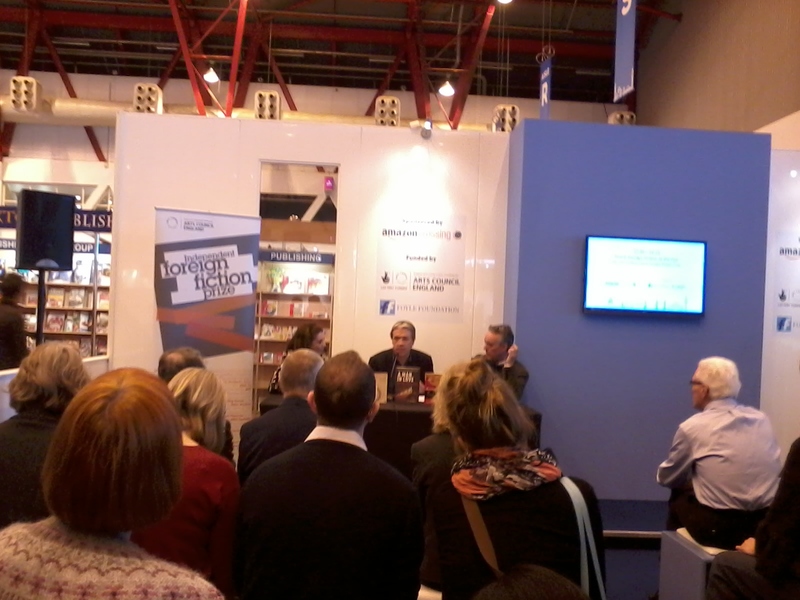 This year is quite special because the LBF is moving next year to Olympia, so it’s their last year at Earl’s Court which is quite sad! This is my 4th year of visiting the LBF and I felt that I had to go to Earl’s Court one last time! I can’t believe they’re redeveloping it! 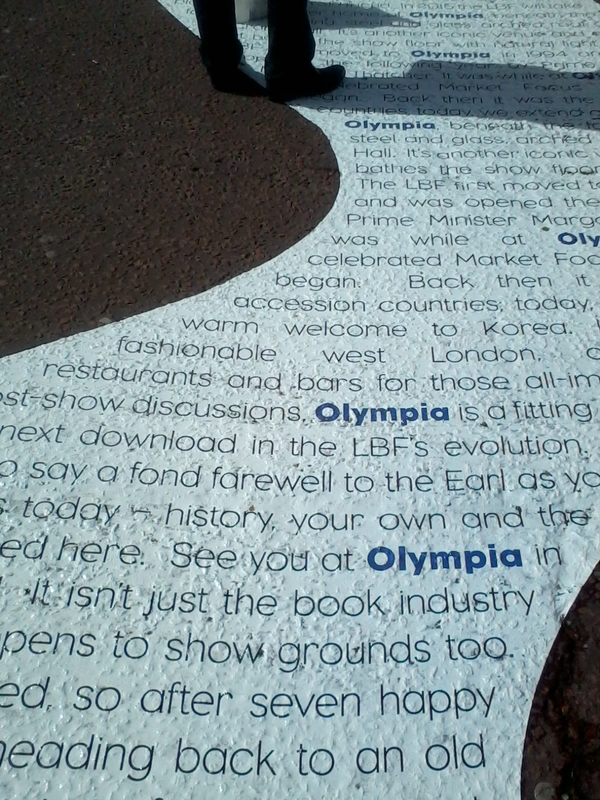 The writing on the ground about the history of the Fair at Earl’s Court, and the future move to Olympia. I had planned to go to the Great Debate first at 11am, but by the time I’d checked my stuff into the cloakroom and worked out where everything was, I had missed the start of it so I decided not to bother and to check out something else instead. 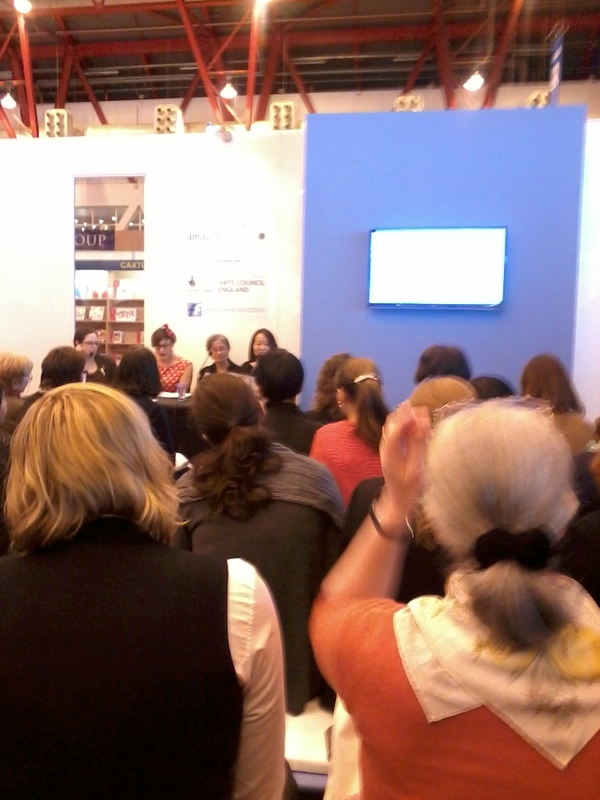 My first seminar was at the Literary Translation Centre, one of my favourite sections of the Fair: Where are the Women in Translation? The impossibly low amount of women in the Independent Foreign Fiction Prize. Possible reasons that women aren’t being published in translation – assertiveness, sexism, etc. The situation in Korea on women in translation. Ways we can get women’s books out there. Then I went to the SYP’s event How to get into Publishing which was very useful, although I already knew a lot of what is required of people trying to get into publishing. I went mainly to see if there was anything new and to hear about the experiences of people already in the industry because they are always interesting to hear. Essentially, you need to have Curiosity, Initiative and Enthusiasm! My only problem was that they all said they were lucky and in the right place at the right time when they got their lucky break, which doesn’t really help those of us who are struggling to get a foot in the door! I also went to How to get ahead in Publishing, also by the SYP. This event was also very useful, although probably more aimed at those already in publishing, but it’s useful to know what you need to aim for and the things to think about as your career progresses. 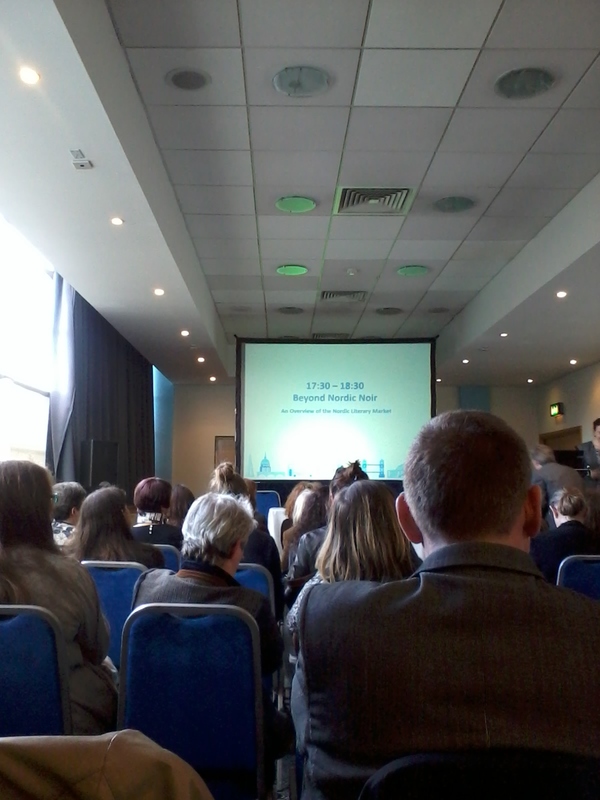 The speakers were really interesting, and their advice and experiences were helpful too. It was great to hear the discussions of the books and translated fiction in general, and I would like to try to read the books in the shortlist, as I was inspired to read a few books from previous years’ shortlists! 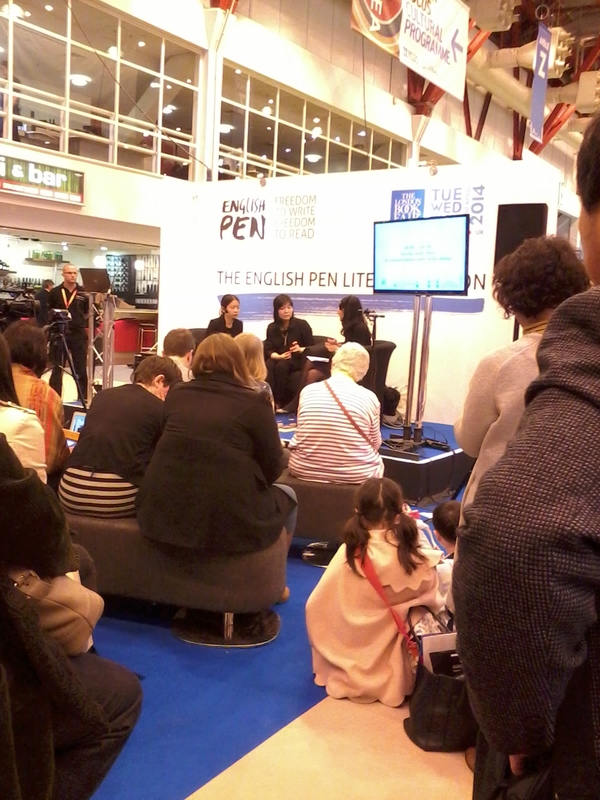 I went to The English PEN Literary Salon to listen to two author interviews, Kyung-sook Shin in Conversation with Arifa Akbar, which was translated from Korean to English and took a bit of time, and Helen Dunmore in Conversation with Jane Shilling. I didn’t stay for long at either, as I was flagging by this point! They were interesting though. I then had some food and then wandered around the stands for a bit in an effort to perk myself up for the last session! How the Nordic market is trying to move away from the dark side of Nordic literature – the incoming trend seems to be comic books, the complete opposite! How Norway supports its book industry through various measures, and some important data facts. Examples of authors and books coming out of Norway, Sweden, Finland, Denmark and Iceland. It was a really good session, and I’ll go into more detail about it in my next blog post! That was the end of my daytrip to the first day of the London Book Fair, and even though I can’t stay for the other two days, I’m glad I made the trip as it was a very informative day! Aside from a copy of the Bookseller LBF daily for the first day of the Fair and a copy of Publishing Perspectives, I also picked up a Books Are My Bag tote bag! 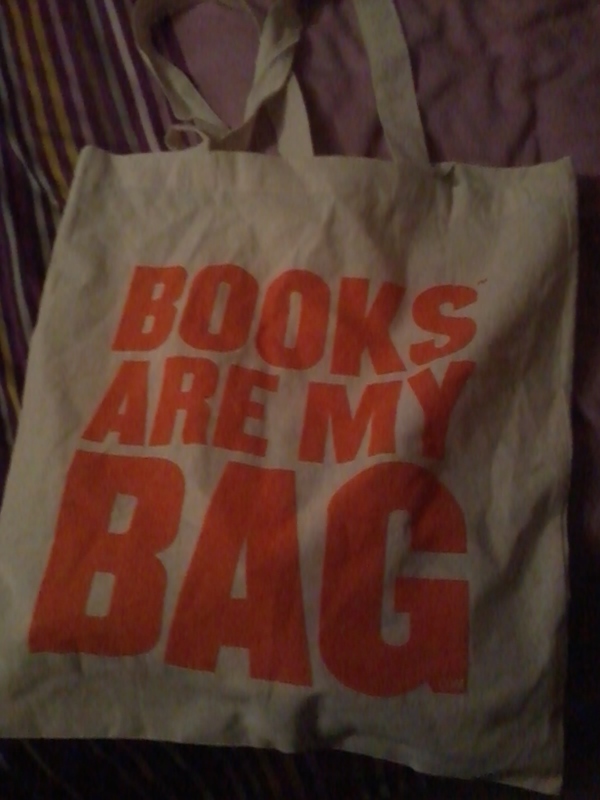 Now I have a way to show the world that “Books are my Bag”! 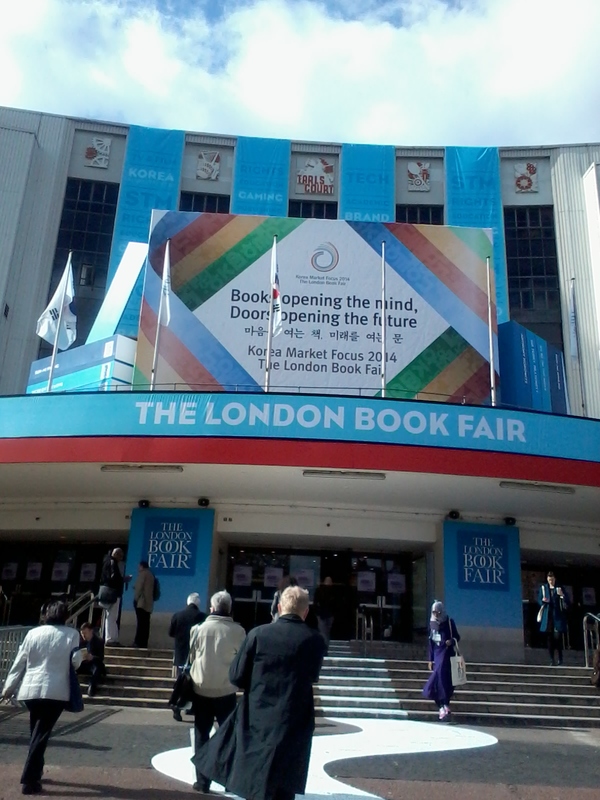 I hope you enjoyed the London Book Fair if you went! I will be writing some more posts soon with more about the seminars I went to and my thoughts on the issues raised. I’ve finished my work placement at Kyle Books! I meant to write an update at the end of last week but I’ve been too busy! On the Thursday evening, I went to a Recruiter’s Evening held by the SYP and mingled with publishing people. I spoke to people from Atwood Tate and Inspired Selection to get career advice, and chatted to other publishing wannabes about their experiences in trying to get a job in publishing. It was really interesting and helpful, and I was really glad I discovered that the event was happening on my very last night in London! I really enjoyed my 2 weeks on placement and was gutted that it had to end! It’s so such a good experience working in London: I really got sucked into the whole atmosphere of living and working in London! It’s great being able to do something useful that actually helps people out, and I learned a lot as well. It gave me more confidence in my skills and abilties, and it was great to be able to talk to people actually working in the industry and seeing how they do they jobs and hear their experiences. It was also great to actually work in a publishing office and see how things are done day to day. I would definitely consider moving to London now, although I would make sure I could afford it first because it was an expensive fortnight! I managed to visit loads of places and only really spent money on food, accommodation and travel because they cost so much that I couldn’t afford to buy much! I’m going back to my job hunt with renewed energy and enthusiasm now! I’m now into the second week of my work experience placement at a publishing house. Today, i have photocopied publicity articles, parcelled up some books with press releases, added AI sheets to kits of book information, copied recipes into new documents, searched for images and formatted them, made a list of images already used for publicity for a book. It’s scary to think i’ve only got four days left, and i’m really enjoying it!